Measuring the effect of therapies is a critical component to improving healthcare. Unfortunately, most measures require expensive and time-consuming clinical visits, additional equipment, or periodic interruptions throughout the day (e.g. journals and diaries). Fortunately, many of us carry mobile phones with an array of sensors that could potentially be used to infer health and mobility throughout the day, with no additional cost or effort. In our lab, we use machine learning to automatically log the activities of our subjects throughout the day (e.g. walking, sitting, standing). I will identify the unique difficulties in doing so for patients with motor impairments. We also measure qualities of those identified activities (e.g. tremor when holding the phone, cadence when walking). Importantly for elderly outpatient populations and people with prosthetic limbs, we have developed an accurate method of fall detection and are able to classify the type of fall to aid in emergency response as well as future prevention. In addition to detailed logs of activities or events, we can distill days of data down to individual scores that our clinicians currently use to quickly evaluate the mobility of patients with Parkinson’s disease. Our approach allows us to continuously evaluate a large number of patients over an extended period of time with no intervention. We expect this to be invaluable to researchers and clinicians in improving the care of patients with impairments in mobility. Dr. Mark Albert is currently a postdoctoral research associate at the Rehabilitation Institute of Chicago and the department of Physical Medicine and Rehabilitation at Northwestern University. He is also adjunct faculty in the department of computer science at Loyola University. Prior to Chicago, he received his Ph.D. in computational biology from Cornell University, with an emphasis on applying efficient coding principles to computational neuroscience. While a graduate student there, he was also part of the mobile phone-based startup company Instinctiv. 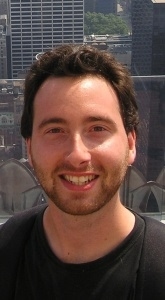 Before Cornell, as research assistant at Carnegie Mellon University, he applied computational models to cognition through human fMRI experiments and to vision in primate neurophysiology. He is a Fulbright Scholar from the University of Vienna and a graduate from Pittsburg State University.